This is an article I wrote for a local magazine. I am reprinting it here in the hopes that it will help you to de-stress a bit this holiday season. Take a moment or two each day to take care of yourself so that you stay well into the new year. With the holidays approaching, it might seem like you don’t have a minute to spare. There are gifts to be bought, parties to be planned and house guests arriving on your doorstep. 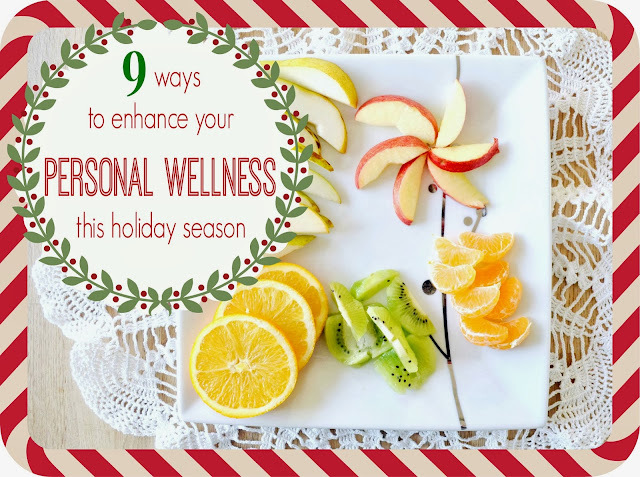 Mix in a tendency to indulge in holiday treats and a few skipped visits to the gym, and you’ve got a recipe for a wellness disaster. Avoid a post-holiday crash by putting yourself at the top of your to-do list. Find a few minutes each day to enhance your personal wellness using these nine simple tips. Holiday stress can cause spikes in your cortisol levels, ramping up insulin production and “many other metabolically devious processes,” according to Markham-based registered nutritionist Emily Kennedy. “Overproduction of these hormones eats up our circulating B vitamins, magnesium and vitamin C.” Offset the effects of stress by eating foods that replenish these vital nutrients. Increase your consumption of leafy green veggies, especially Swiss chard, kale, broccoli, rapini and bok choy. Add more brightly coloured veggies and fruits to your diet, such as bell peppers, berries, cherries, citrus fruits, peaches and melons. Incorporate lean protein, such as black beans, seeds and shiitake mushrooms. Mrs Kennedy’s favourite stress-relieving foods are pumpkin seeds and cocoa powder - great sources of magnesium. Whether you’re headed to the mall or the office, pack fruit or vegetables for a 4 p.m. snack. "We all have a blood sugar dip around that time, making us more likely to nosh on quick-release, high GI refined carbs,” says Mrs Kennedy. Pair an apple with almond butter or a pear with a few walnuts for a blood sugar-balancing afternoon pick-me-up. 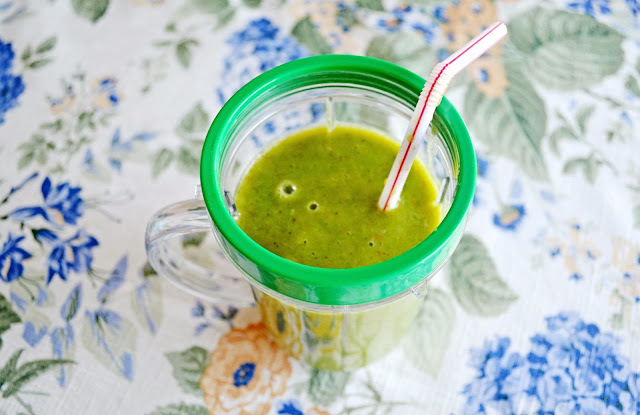 “Being well hydrated improves satiety levels, increases elimination of toxins and curbs the need for caffeine or sugary drinks,” says Mrs Kennedy. Bonus points if you add fresh lemon juice. “The lemon gives a bit of vitamin C and is touted to improve digestion, the glycemic impact of your meal and the acidity of your body,” she notes. Other quick ways to jazz up your water - add sliced cucumber, strawberries or grapefruit for extra nutrients and flavour. Or try shredded ginger for a little heat. Take a break from the hubbub and drink a cup of green tea. Compared to other teas, green tea reportedly contains the highest concentration of polyphenols. These powerhouse antioxidants fight free radicals - harmful compounds that can mutate your body’s cells and damage DNA. According to a study of almost 14,000 Japanese adults age 65 and older, green tea drinkers may have a lowered risk of functional disability as they age. The study, reported in the American Journal of Clinical Nutrition, suggests that drinking green tea might help you to perform daily activities like dressing, bathing and doing housework into your golden years. Researchers, led by Yasutake Tomata of Tohoku University Graduate School of Medicine, found that almost 13 percent of adults who drank less than a cup of green tea per day became functionally disabled within the three years of the study. That compared with just over 7 percent of those who drank five or more cups of green tea each day. When life gets hectic, don’t skip your workout completely. Instead, condense your workout or choose a new workout that involves faster movements and different body parts. “By engaging different body parts you’ll burn more calories,” says Mr. Evans. “Your body will continue to burn more calories after the workout too.” If you really can’t find the time to exercise, Mr. Evans recommends brainstorming some creative ways to stay active. “It might be taking the stairs rather than the elevator or parking farther away from the mall,” he says. Look on the bright side - now you can embrace the fact that you have to park a mile from the mall doors! Be in the present moment. Let the body be fully awake, alert and alive. Close your eyes. Note your feelings. Tune into any discomfort or unpleasant feelings. Rather than trying to push them away, acknowledge them. Scan the body and take note of any pain or tightness. Direct your full attention to your breathing. Feel the belly rise with each breath in and recede with each breath out. If your mind has trouble focusing on the breath, try repeating, “breathing in…breathing out” until you have gathered your full attention to the breath. Expand your awareness to the body as a whole, noting any tightness or tension in the shoulders, neck, back or face. Watch it all with a softer and more spacious awareness. When you’re ready, open your eyes. Bring this expanded and more accepting awareness to the next moments of your day. Happy Holidays friends! Are you taking care of yourself? Happy Holidays to you and your family too Mary! 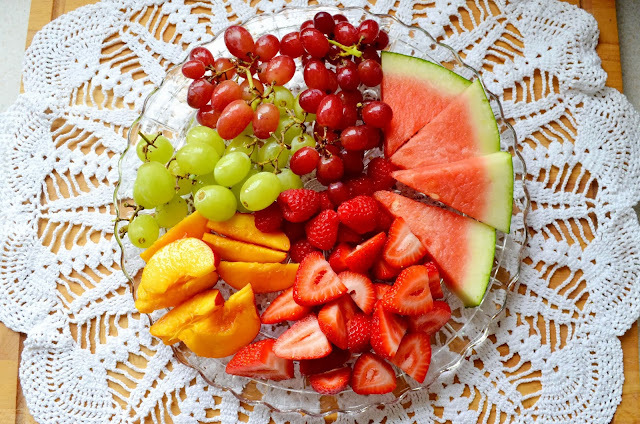 I love the yummy and delicious fruits! I'll really try to follow these rules. I love fruit too! Happy Holidays! This article is spot on. (Erm, I have done none of these things even though I know better - thanks for the reminder).